It’s an old philosophical question. If you were to replace a ship piece by piece over the course of a year, is it still the same ship? What about a game engine? We believe 2018 will mark a new beginning for Lumberyard. With our overhaul of legacy tech near complete (10 out of 12 major systems changed), and seven brand new systems in place, it’s time to accelerate towards full release. You can download Lumberyard Beta 1.12 here. This year has been all about laying the foundation for what’s to come with Lumberyard. We’ve introduced a brand new animation tool (EMotion FX) and a new visual scripting solution (Script Canvas). We’ve made hundreds of improvements to Component Entity workflows for streamlining development and launched seven new Cloud Gems that make it easier to engage players and create emergent gameplay using the AWS cloud. We also provided an exclusive, free license to SpeedTree 8, the industry standard in 3D vegetation modeling, so you can make massive, gnarly forests quicker and with greater fidelity. All of this translates to the engine we’re envisioning for 2018: an engine that’s easy to use, and yet powerful enough to push the limits of what’s possible in games. Where the massive compute and storage of the cloud becomes a catalyst for innovation and large-scale ambition–a new way of making games. We’re not completely there yet, but here are the top five highlights from this year that have helped clear the way. The Cloud Gem Framework makes it easy to build great gameplay and engage your players in as little as few hours, using AWS. 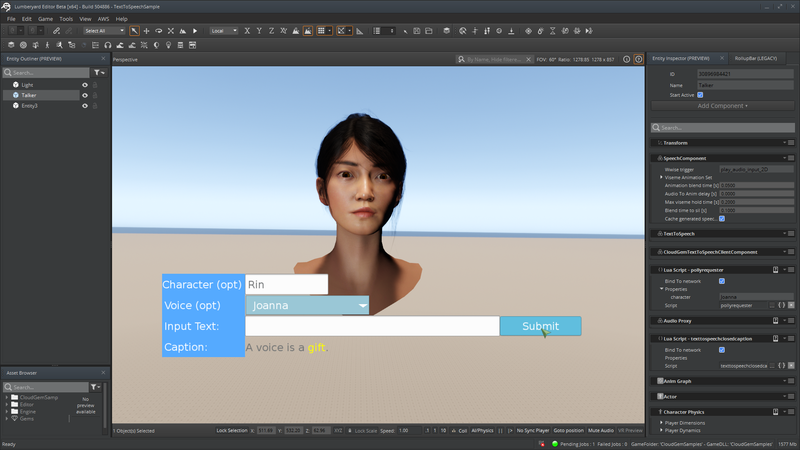 Add text to speech, in-game surveys, and speech recognition capabilities in your games. Unlock new possibilities for game development and different experiences previously unavailable. We all know the value of leaderboards in multiplayer games, but what about leveraging procedural voice generation for thousands of NPCs in an MMO? Or adding new accessibility options for your games by leveraging voice recognition? By requiring fewer engineers to build backend solutions, gems can not only save you money, but they can also change how games are made. Seamlessly integrated with the engine’s advanced rendering and lighting technology, the SpeedTree editor makes it easier and faster to create detailed vegetation in your games. You can also buy pre-made trees and other assets from SpeedTree to get going faster. Just visit the SpeedTree store and follow the steps to activate your license. There’s also in-depth documentation and a quick start tutorial to help you get started. We swapped out CryAnimation for EmotionFX in 1.11, and we’re continuing to add improvements and functionality with subsequent releases. Now you can create character animations in as little as 10 minutes with little to no engineering chops, including functionality like blendtrees, state machines, blendspaces, and motion extraction. EMotion FX has been used by the likes of EA and Ubisoft for over a decade, and now it’s a permanent part of Lumberyard, providing a powerful and easy solution for artists. Script Canvas provides an approachable solution for authoring behaviors while utilizing the same framework as Lua and C++. That means you can take those cool characters you animated using EMotion FX and quickly create scripted behaviors using Script Canvas—all without the need for engineers. With its familiar node interface, Script Canvas will make it easier to build quality gameplay experiences, even if you have limited programming experience. The Starter Game sample showcases a number of engine features for Amazon Lumberyard. 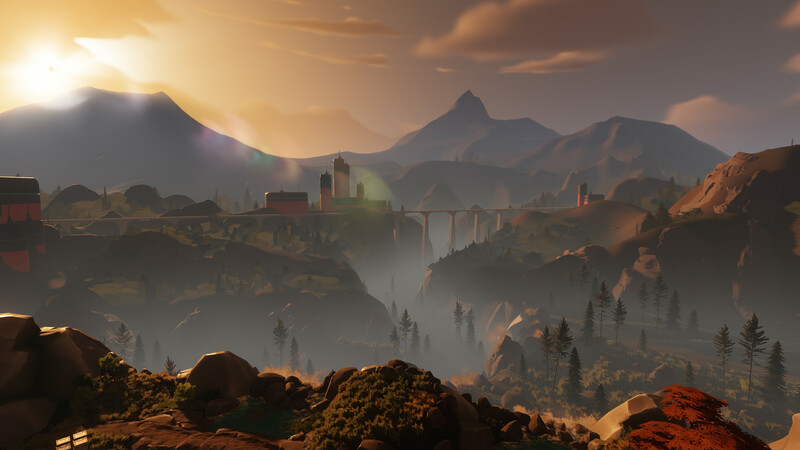 It’s not just a quick path to get started with the engine; it’s also a great example of what you can build today using Lumberyard. Since launching in May, we’ve added gameplay features like over-the-shoulder aim, double jump, a more responsive AI, mission progression with cascading slices, and much more. There are over 500 free assets here for you to use, learn from, and kick start a game of your own. Starter Game comes pre-installed with Lumberyard 1.12. Our goal is to make Lumberyard the most developer-focused engine ever, where every update, fix, and feature begins with the customer in mind. Thanks to your on-going feedback and support, we’re closer to making that a reality. As always, let us know what you think at: lumberyard-feedback@amazon.com. Happy holidays! To download Lumberyard 1.12, visit our downloads page. 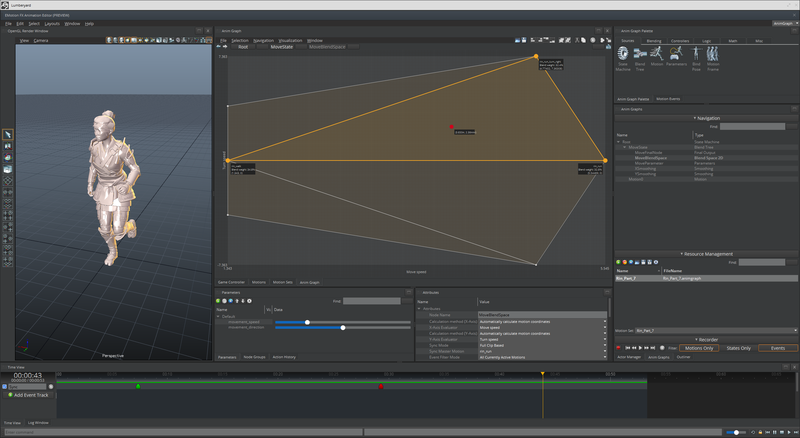 To learn more about Lumberyard 1.12, see our release notes.